Naima was called to the Bar of England and Wales in 2012 and qualified as an Advocate of the High Courts of Pakistan in 2015. She has a keen interest in protecting the rights of vulnerable individuals. 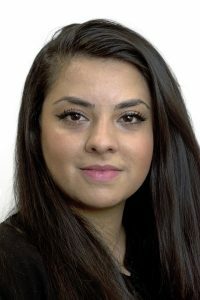 Prior to commencing the fellowship, Naima gained significant experience in private family law proceedings and landlord/tenant disputes by volunteering for a Duty and Family Advice Scheme at Willesden County Court. In addition to her experience in family law, Naima has a longstanding commitment to human rights and interest in international law. This drew her to Pakistan where she had the opportunity to expand her experience to include issues such as forced/child marriage, domestic and honour based violence, stranded spouse and international child abduction cases. She conducted extensive research on the rights of women, children and religious minorities. She also conducted research for a leading Pakistani Supreme Court lawyer on state responsibility to and the status of human rights defenders in the Americas. In 2016, Naima completed her LLM in International Law. She worked as an Academic Research Assistant in the area of restorative justice in prisons. Her summative essay entitled ‘United we stand, divided we fall: terrorism as an international crime versus terrorism as a transnational crime’ was selected from 65 first class submissions to be published in the inaugural edition of the Student Law Review. She also undertook transnational research and completed her dissertation on "The administration of the death penalty in Pakistan and its compatibility with international and shariah law." As a staunch opponent of the death penalty, Naima represented an appellant facing the irreversible punishment in the High Court in Pakistan and was successful in getting his sentence commuted to one of life imprisonment. The Court commended Naima for her ‘industry and zeal’. She continues to volunteer remotely for a human rights organisation committed to defending the rights of prisoners and the abolition of the death penalty. Naima is fluent in Urdu and Hindi. Naima is currently completing the first year of her fellowship at the Bar Pro Bono Unit as a caseworker where she is gaining insight into numerous areas of law, including, employment and immigration and asylum. Naima is looking forward to starting pupillage at Pump Court Chambers in October. Naima is working with her co-fellow, Harriet, on their project focusing on public legal education. The project aims to empower children with the confidence and requisite knowledge to enable them to safeguard their legal rights. They are hoping to collaborate with existing charities by delivering lessons in schools on important issues such as local authority intervention, child arrangement orders and the role of the family courts in protecting those who are at risk of forced marriage and FGM. Naima and Harriet are also exploring the use of technology to facilitate broader access to justice in family law for an additional project.